Tonight for the weekly Wednesday Review, I have something a little different. 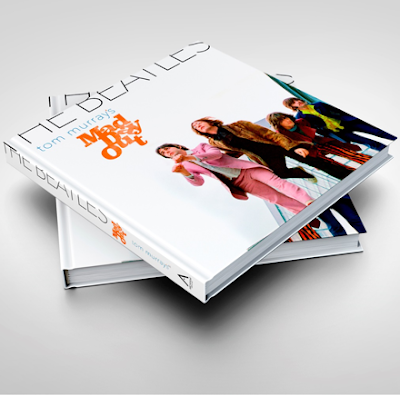 And it is an exclusive to "Meet the Beatles..for Real!" 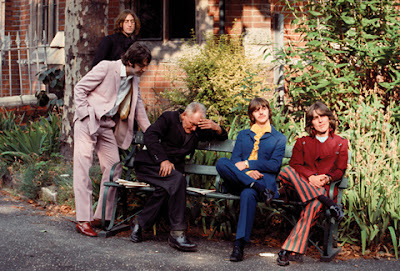 Over the years of running this blog, I have learned that one of my favorite photo shoots, the 1968 Mad Day Out, is one of all of yours as well. One of the photographers that was there on July 28, was Tom Murray. He didn't even know who he was going to be shooting, but just went along with another photographer and had two rolls of film with him. Tom was just 25 years old at the time, and was the youngest person among the photographers. Tom has a new book called Tom Murray's Mad Day Out that features the photographs he took on that sunny Sunday in London. Many of them have became classic photos to Beatle fans around the globe. This is my all time favorite photo taken during the Mad Day Out. I used to have it as a poster hanging above my bed in my dorm room in college in the mid 1990's. I was able to quickly interview Tom and asked him some questions that I thought would fit in with the theme of this blog. Sara: How many photos of the Beatles did you take for the "Mad day Out" session? Tom: I took less than 40 images all during the day, when I had processed the 2 rolls of color film, I edited them down to 23 of the very best and destroyed the rest. Sara: Which of the photo are your favorites? Tom: "Nowhere man", as he never knew the most famous four boys in the world were all around him, he never woke up from his nap, I also love my solo photo of George and the one of Paul profile. Photo by Tom Murray-- "Nowhere Man"
Sara: My blog is about the Beatles' fans and encounters the fans had with the boys. Do you recall any interactions the Beatles had with their fans during the sessions? Were the fans still having Beatlemania in 1968? Tom: The fans were all so surprised to see the Beatles, Sunday in 1968 was very quiet, most shops did not open, pubs not until afternoon, it was church then home. We did cause two small fender benders of kids screaming "dad dad it’s the Beatles", then boom. Much to every one’s surprise, the Beatles did occasionally dash into the crowds. Most of the time we could travel around without any fuss, as no mobile phones to give the game away. Several girls were outside Paul’s house, two fainted when they saw all the Beatles getting out of the car. Sara: Were you a Beatles fan before the photos? After meeting the Beatles, did your feelings about them change any? Tom: Loved the music, wore out the 45s and the LPs, every new record was taken to the Sunday Times studio and played full volume all the time. I thought they were a great bunch of guys, mostly around my age, it never dawned on me how famous they had become until folks found out I had spent the whole day with them. Sara: The blog also likes to focus a bit on the people in the Beatles inner circle, Mal Evans, Neil Aspinall etc. What members of the inner circle were there (I know I have seen photos of Mal Evans) and how did they help the photo shoot? Tom: Mal drove them around all day in Georges, Dark Green Mercedes Pullman, Mal’s son was with us, Yoko stayed In the background, the four Beatles really bounced ideas of off each other as we went from place to place for what is now knows as Tom Murray’s Mad Day Out. When I got my Jaguar XK 150 back to my mother’s home, where I kept it, she asked:- “ what kind of day I had”, I told her I has spent all day with the Beatles, she screamed then she asked what was it like, I said:- “it was a Mad Day Out”. I want to send Tom Murray a big thank you for taking the time to answer my questions. I hope you all found what he had to say as interesting as I did! 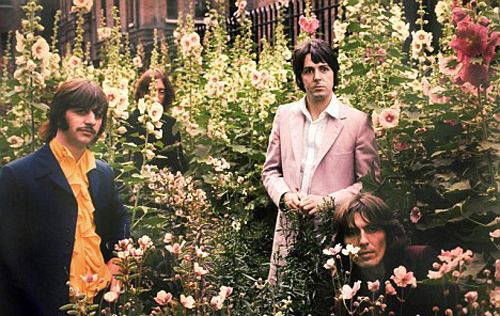 Just a little peek into the Beatles in 1968. I love it! I also want to thank Gabriella Vivaldi for her patience with me and for contacting me about this interview! I do not have the book "Tom Murray's Mad Day Out" yet. However, I have only heard great things about the book and I am seriously thinking that I need to purchase a copy for myself for Christmas. The book not only features the photographs, but also contains Tom's memories of the day. It is an expensive book ($100) but is from Archivum Publications, which put out outstanding books. There aren't a lot of the books left, so if you are wanting one, you need to act fast! Please follow this link. awesome interview!!! what a fun opportunity for you to connect with the Mad Day Out photographer, super cool. Short but dripping with details and info! So much in just that little interview, I wouldn't even know what to single out! Thank you Tom, and thank you Sara!!!! I love the Mad Day Out photo shoot and am happy to hear it was as "mad" as I've always thought!